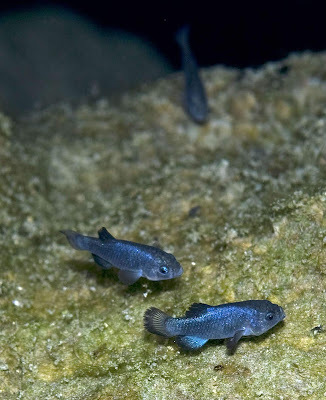 Devil's Hole pupfishes Cyprinodon diabolis, photographed by Olin Feuerbacher. The Cyprinodontiformes, killifishes and related forms, are a cosmopolitan group of small fishes usually found in estuarine or marine environments (Bond 1996). Characters (from Bond 1996). Soft-rayed physoclists with abdominal pelvic fins. Single dorsal fin set behind middle of body. Caudal fin with varying number of rays, never forked. Orbitosphenoid, mesocoracoid, and basisphenoid absent; maxillaries excluded from border of mouth by premaxillaries. Lateral line canal system incomplete or not well formed on head and body. [A02] Able, K. W. 2002. Killifishes. Family Fundulidae. In: Collette, B. B., & G. Klein-MacPhee (eds) Bigelow and Schroeder’s Fishes of the Gulf of Maine 3rd ed. pp. 292–297. Smithsonian Institute Press: Washington. 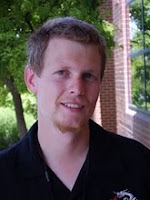 [B-RB13] Betancur-R., R., R. E. Broughton, E. O. Wiley, K. Carpenter, A. López, C. Li, N. I. Holcroft, D. Arcila, M. Sanciangco, J. C. Cureton, II, F. Zhang, T. Buser, M. A. Campbell, J. A. Ballesteros, A. Roa-Varon, S. Willis, W. C. Borden, T. Rowley, P. C. Reneau, D. J. Hough, G. Lu, T. Grande, G. Arratia & G. Ortí. 2013. The tree of life and a new classification of bony fishes. PLoS Currents Tree of Life April 18 2013. doi: 10.1371/currents.tol.53ba26640df0ccaee75bb165c8c26288. [CA00] Coad, B. W., & A. Abdoli. 2000. Systematics of an isolated population of tooth-carp from northern Iran (Actinopterygii: Cyprinodontidae). Zoology in the Middle East 21: 87–102. [D83] Darovec, J. E. 1983. Sciaenid fishes (Osteichthyes: Perciformes) of western penisular Florida. Memoirs of the Hourglass Cruises 6 (3): 1–73. [F15] Fowler, H. W. 1915. Cold-blooded vertebrates from Florida, the West Indies, Costa Rica, and eastern Brazil. Proceedings of the Academy of Natural Sciences of Philadelphia 67 (2): 243–269. [F16] Fowler, H. W. 1916. The fishes of Trinidad, Grenada, and St. Lucia, British West Indies. Proceedings of the Academy of Natural Sciences of Philadelphia 67 (3): 520–548. [HB81] Humphries, J. M., F. L. Bookstein, B. Chernoff, G. R. Smith, R. L. Elder & S. G. Poss. 1981. Multivariate discrimination by shape in relation to size. Systematic Zoology 30 (3): 291–308. [LD09] Li, B., A. Dettaï, C. Cruaud, A. Couloux, M. Desoutter-Meniger & G. Lecointre. 2009. RNF213, a new nuclear marker for acanthomorph phylogeny. Molecular Phylogenetics and Evolution 50: 345–363. [MGV06] Mai, A. C. G., A. M. Garcia & J. P. Vieira. 2006. Ecologia alimentar do barrigudinho Jenynsia multidentata (Jenyns, 1842) (Pisces: Cyprinodontiformes) no estuário da Laguna dos Patos, Rio Grande do Sul, Brasil. Comunicações do Museo de Ciências e Tecnologia da PUCRS, Serie Zoologia 19 (1): 3–18. [MWW89] Miller, P. J., J. Wright & P. Wongrat. 1989. An Indo-Pacific goby (Teleostei: Gobioidei) from West Africa, with systematic notes on Butis and related eleotridine genera. Journal of Natural History 23: 311–324. [ND13] Near, T. J., A. Dornburg, R. I. Eytan, B. P. Keck, W. L. Smith, K. L. Kuhn, J. A. Moore, S. A. Price, F. T. Burbrink, M. Friedman & P. C. Wainwright. 2013. Phylogeny and tempo of diversification in the superradiation of spiny-rayed fishes. Proceedings of the National Academy of Sciences of the USA 110 (31): 12738–12743. [PC01] Pichelin, S., & T. H. Cribb. 2001. The status of the Diplosentidae (Acanthocephala: Palaeacanthocephala) and a new family of acanthocephalans from Australian wrasses (Pisces: Labridae). Folia Parasitologica 48: 289–303. [R88] Rauchenberger, M. 1988. Historical biogeography of poeciliid fishes in the Caribbean. Systematic Zoology 37 (4): 356–365. [R86] Rivas, L. R. 1986. Comments on Briggs (1984): freshwater fishes and biogeography of Central America and the Antilles. Systematic Zoology 35 (4): 633–639. [S92] Smith, G. R. 1992. Introgression in fishes: significance for paleontology, cladistics, and evolutionary rates. Systematic Biology 41 (1): 41–57. [USDI77] United States Department of the Interior. 1977. Endangered and threatened wildlife and plants—republication of list of species. Federal Register 42: 36420–36431.